It is the goal of all four Gospel accounts to tell us about the nature of the person and work of Jesus Christ. Today’s reading from Mark’s Gospel account makes it very clear that Jesus is both God and man. It has been a day of teaching and healing. As the sun goes down, Jesus decides to cross the Sea of Galilee. At first, it might seem a little unusual to set out across the Sea as the sun is going down, but remember that some of Jesus’ disciples were fishermen who regularly fished the Sea during the night. At any rate, a small group of boats leaves the shore for the other side as the sun dips toward the horizon. Once they are under way, Jesus takes a nap. Jesus has been teaching and attending to the needs of the crowds all day. He is tired and He falls asleep in the stern of the boat. That Jesus gets tired and falls asleep is a property that Jesus shares with us. He is tired. He sleeps like any other man. Here we see one of the many characteristics that show us that Jesus Christ is true man. Now the old saying is, “Everybody talks about the weather, but nobody does anything about it.” In this case the saying is not true. Jesus doesn’t talk about the weather. He talks to the weather and the weather does what He tells it to do. This shows their desperation. After all, Jesus has grown up in the building trade and is not an experienced sailor. Of course, it doesn’t take a whole lot of skill to grab some sort of container and use it to bail water out of the boat. It’s at this time that Jesus does something totally unexpected. He scolds the wind and the waves. He speaks to them like a group of unruly children. Mark 4:39 (ESV) 39 And he awoke and rebuked the wind and said to the sea, “Peace! Be still!” And the wind ceased, and there was a great calm. So here is Jesus demonstrating the human property of exhaustion and the Divine power of control over creation. Here we see a demonstration that Jesus is both God and man. Here we see another example of Jesus demonstrating the truth of Mark’s opening statement – that Jesus Christ is the Son of God. Here we see the answer to the question, “Who then is this, that even the wind and the sea obey him?” This is none other than the God-man Jesus, the Christ. Today’s Gospel not only tells us that Jesus is both God and Man, but it also tells us why it is important that the Son of God assumed a human nature. Every storm is an expression of the curse that came when sin entered the world. Sin not only brings sickness and death to us, but even the world is cursed. The Holy Spirit inspired Paul to write to the Romans: Romans 8:22 (ESV) 22 For we know that the whole creation has been groaning together in the pains of childbirth until now. Floods, fires, hurricanes, tornadoes, hail, lightening, earthquakes, and all the other natural disasters are the result of the curse that sin brings into the world. These natural disasters are not the only storms that sin brings into the world. There are other storms in our lives as well. There are the medical storms of infection, heart disease, diabetes, stroke, cancer, and on and on. There are the relational storms of broken families and friendships. There are the financial storms of plant closings and layoffs. Ultimately, there is the storm of death that comes to all of us sooner or later. We may try to deny the existence of sin in our lives, but these storms, both private and public, say otherwise. 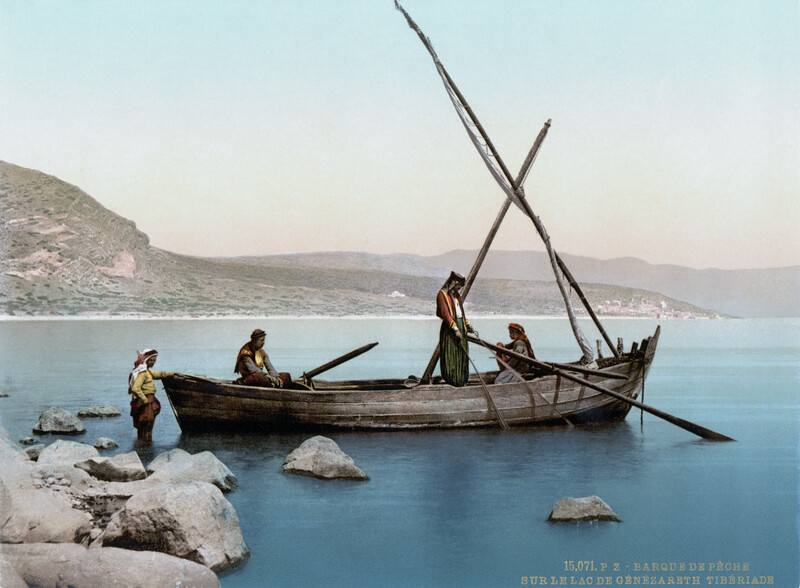 Although we may be nowhere near water, these storms often give us the same sinking feeling that the disciples had on the Sea of Galilee. We may indeed ask the same question that the disciples asked, “Teacher, do you not care that we are perishing?” We may indeed come to the point that we wonder if God really cares for us. It is in the incarnation of Jesus Christ – the fact that the Son of God assumed human nature – that we see God’s care. In Jesus Christ, God assumed human nature to save humans from their nature – their sinful nature. For our own sin doomed us to perish – not just from this earth, but also from the blessings of God’s presence with us. We would be lost forever unless delivered from sin, death, and everlasting condemnation. But the Father of all mercy and grace sent His Son Jesus Christ, who atoned for the sin of the whole world that whoever believes in Him should not perish but have eternal life. The one who stilled the water and even walked the on water eventually spilled forth water. As Christ’s dead body hung from the cross John 19:34 (ESV) 34 …one of the soldiers pierced his side with a spear, and at once there came out blood and water. With that water and that blood the one who brings peace to wind and water also brings peace between man and God. From His baptism in the water of the Jordan to the pouring forth of water from His heart, Jesus sanctifies and institutes all waters to be a blessed flood and a lavish washing away of sin. For in those waters He removes all sin from us and takes it onto Himself so that He can withstand the justice of God in our place. With the pouring forth of the water and the blood in His suffering and death on the cross, Jesus satisfies God’s justice against our sin. The water that pours forth from Jesus’ side as He hangs dead on the cross reminds us of another pouring of water – water that joins us to Christ in His death – the water of Holy Baptism. It is in that water that we receive the credit that Christ earned for us with His death on the cross. It is also with that water that we receive the blessing of His resurrection. For Christ does not remain in the grave, but, after He conquers death, He rises from death never to die again. Just as Holy Baptism unites us to Christ in His death, so also it unites us to Him in His resurrection so, Romans 6:4 (ESV) 4 We were buried therefore with him by baptism into death, in order that, just as Christ was raised from the dead by the glory of the Father, we too might walk in newness of life. Jesus Christ is both fully God and fully man. With that combination, we find our full salvation from sin, death, and the power of the devil. In His humanity, He is able to suffer on the cross in our place and for our good. In His deity, He is able to defeat our foes and rise from the dead to give us eternal life. It is in the person of Jesus Christ who both sleeps and stills the storm that we have our faith and the promise of eternal life. Previous Article Giving seeds a pep talk doesn’t work. Next Article Where is God when I am suffering?